Meatballs and rice are a great go-to weeknight meal. All you’ve got to do is mix up the ingredients, roll some meatballs (kids can help too), then pop them in the oven. A pot of rice can cook on the stovetop while the meatballs bake, and if you like, you can throw together a salad at this point, too. We love switching it up sometimes and giving our meatballs a different flavor than the usual Italian or Mediterranean. A little ginger, a splash of soy sauce and lime juice, and you’ve got a unique flavor profile that everybody will love. 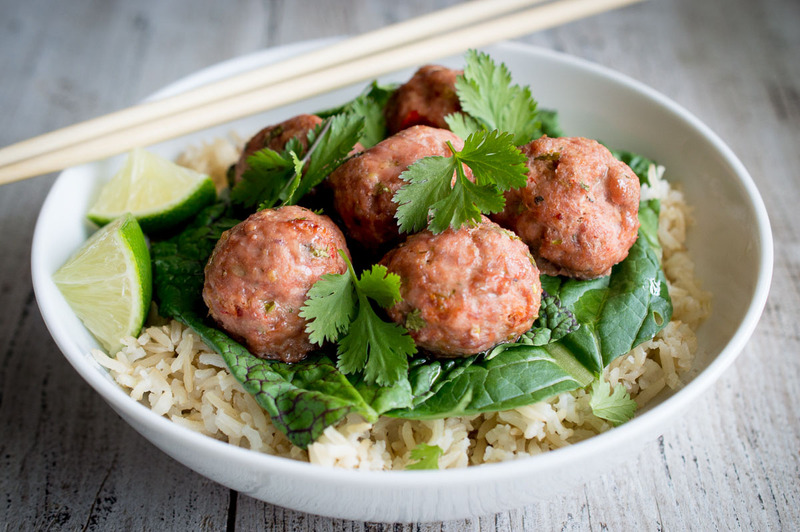 You can serve these meatballs over rice for dinner, in lettuce cups as an appetizer, or even sliced and layered into a bánh mi sandwich. You also might find yourself popping them into your mouth as an afternoon snack. Enjoy them any way you like! Heat the oven to 375ºF and line a baking sheet with parchment paper. In a large mixing bowl, combine all of the ingredients until well mixed. Using your hands, roll the meat mixture into golfball-sized meatballs and place them on the lined baking sheet. Bake the meatballs for 30 minutes, or until baked through and just beginning to brown. Serve with steamed rice, fresh cilantro, and lettuce. 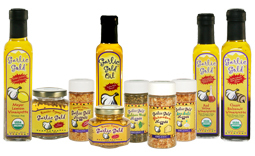 Drizzle with Garlic Gold Oil® just before serving if desired. Sign up for our Newsletter and receive a coupon for $5 off your next order. when you buy a case! This is the most delicious asparagus recipe you’ll ever make! It’s easy to make, and a guaranteed crowd pleaser for… https://t.co/MCUcahCPNK about 4 hours ago from Hootsuite Inc. This is our favorite preparation of Delicata squash, and it couldn’t be more easy. Filled with red onions and drizz… https://t.co/krKywIVco5 about 9 hours ago from Hootsuite Inc.